The goal of the Cycfi XR is to be a “high fidelity” magnetic transducer. To that end the XR has been engineered to capture the signal induced by the string, with no added coloration, throughout the range of human hearing. A nice analogy between a Cycfi XR pickup and a normal magnetic pickup, is to compare a condenser microphone with a dynamic microphone. A good recording engineer can and will use both, but it is easier to change the sound of the condenser mic to be more like a dynamic mic, than it is to change the sound of a dynamic mic to be like that of a condenser mic. This is not a perfect analogy though. Dynamic microphones capture a much wider frequency range than traditional pickups whose Lo-Fi bandwidth starts to fall off around 2-6 kHz. Apart from raw bandwidth, what’s equally crucial is the predictability and linearity of the response over this range. Guitars have their own individual sonic signature, thus the idea of a transducer which imparts very little coloration to the sound is appealing. You can always shape the frequency response at any point in the signal chain using various analog or digital filters. Having a wide and flat frequency response gives you total freedom to sculpt the tone. Starting with the pure sound of the guitar, you have better control, using appropriate EQ, to achieve whatever tone you want, rather than being limited to a fixed, predetermined guitar tone dictated by the pickup manufacturer. If we start with an already colored signal, we have limited what can be accomplished with the effects, amps, plugins, etc. The key is Lo-Z. To get a Hi-Fi uncolored signal, the Cycfi XR is designed as a low-impedance (Lo-Z), low-output pickup. Cycfi XRs operate under exactly the same principles as a conventional pickup. The difference is, instead of using many turns of wire to get a good signal output (at the expense of coloration of the sound) the XR starts by using far fewer turns of wire. Lo-Z pickups inherently have full frequency response from 20Hz to 20kHz and beyond. Unlike traditional high-impedance passive pickups there are no big peaks and dips in the spectrum, typically perceived as the pickup’s “character”. That does not mean that Lo-Z pickups lack character. In fact a Lo-Z coil’s characteristically wide bandwidth gives it a voice all its own. The pickups are very rich in harmonics, with uber-clean sounds, lots of overtones and crystal clear highs. They have a lot more harmonic content than even the bright Stratocaster pickup (which has frequency response that rolls off at around 5KHz.) On the low end of the audio spectrum you get tight, well-defined and focused bass all the way down to 20Hz. The use of low impedance pickups is not a new idea. An important example is Les Paul’s favorite guitar and the one he used since the early 1970s: the Les Paul Recording Model. For Les Paul, it’s the the ultimate recording guitar. It was designed to be plugged directly into a mixing console. (Now that’s a cool idea!) The only problem was that only a select few at the time could afford owning a mixing desk. In addition, the output of the low impedance pickups could not sufficiently drive guitar amplifiers like a Marshall (Yet, driving amplifiers into saturation was what people wanted!). Les Paul worked his whole life to get rid of distortion. It took him years to develop low impedance pickups with that bell-like clarity and direct to board recording capability. It did not catch on, perhaps because it was way ahead of its time. This Lo-Z design requires active pre-amplification to get the signal level up to approximately the same level as a “normal” magnetic guitar pickup. For that matter, active XR pickups include an integrated low-noise, linear preamplifier, using modern SMD components to keep the footprint as small as possible. Everyone in the music industry switched to Lo-Z early on, except the guitar industry! “To achieve the widest variety of sounds, all parts of the chain (guitar, strings, controls, cable, amp and speaker) must be considered as a total, capable of reproducing a wide range of frequencies. There are two ways to achieve this: We either keep both the inductance of the pickups and the cable capacitance as low as possible or we introduce 2-way pickup systems where the high impedance part reproduces the lows and the low impedance part reproduces the highs, just like a 2-way speaker system. We are paying today for the biggest blunder that the guitar industry made. In the mid-30s, in Berlin, at the Telefunken Research Lab, Neuman (sic) and his team of engineers designed the condenser mike and the first tape recorder with magnetic pickups. To achieve a true reproduction of sound, they had to use low impedance. In 1947, the low impedance tape recorder was introduced in the US, and a new company called Ampex started to produce them. A few years later, the major recording studios were using tape recorders; by the early 50s, the whole world, with the exception of the guitar industry, had switched to low impedance, and it was called High Fidelity — or just Hi Fi. The guitar industry did not recognize the advantage of low impedance and did not make the switch. Today, a change to low impedance is virtually impossible. There are too many amps and guitars floating around, and we are stuck with all the disadvantages of high impedance. 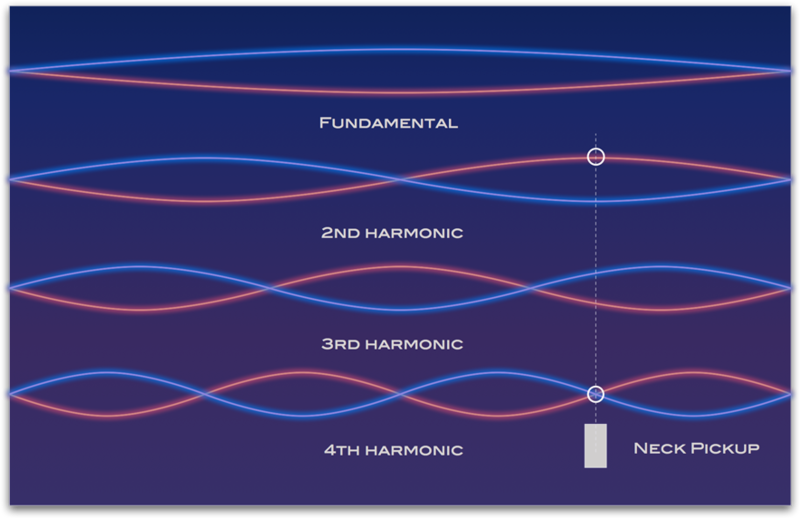 Pickup position on the instrument (relative to distance from the bridge or nut) has a large bearing on the sound spectrum, or timbre, of the instrument. 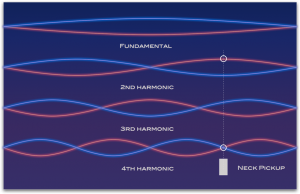 Different locations will produce different levels of string harmonics which will change depending on the string lengths as they are fretted. With multiple pickups (or pickup modules) in different locations, and the ability to switch configurations and connections of the pickups, some widely different string signals can be captured. This works well with tone shaping stages (amps, effects, plugins, etc.) further down the electronic chain. Many circuits have been invented and refined for electric guitar pickups to create different timbres from the same instruments. Many of the same switching diagrams which you can find in various locations on the internet for passive pickups can be used with Cycfi XR pickups. Low impedance passive pickup signals can be switched and the pickups can be put in series or parallel configurations in the same way as high impedance pickups. Traditional Hi-Z pickups, when wired in series produce a darker sound because the resonant frequency is shifted down. Be aware though that the resonant frequency of the Lo-Z XR pickups is in the ultrasonic range, regardless if they are wired in series or in parallel. Sonically speaking, it will not make a difference, since we won’t hear the frequency shift. The only advantage to wiring Lo-Z coils in series is higher output. With the Resonant Filter system, you have the power to continuously vary the resonance peak and width to achieve vastly more tones than is possible with simple switching. EMG is a trademark of EMG, Inc. The use of this trademark does not imply any affiliation or endorsement by the trademark holder.